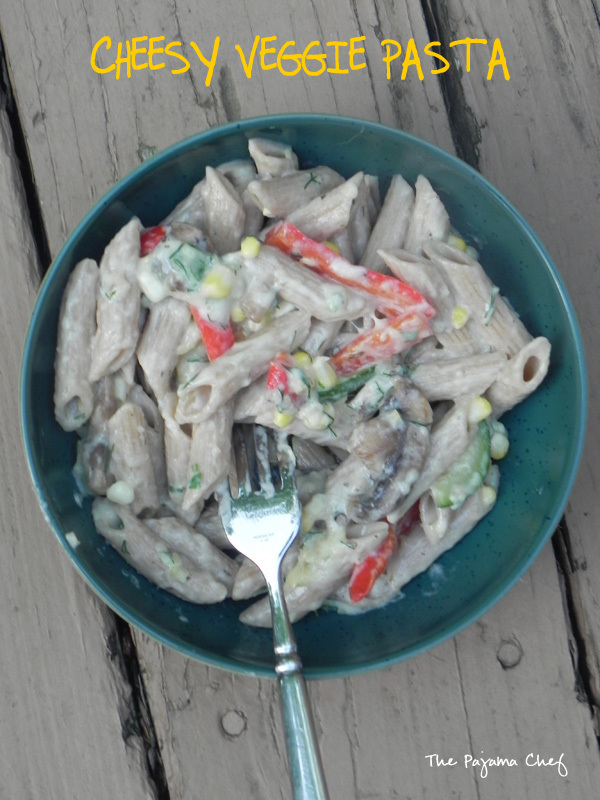 This pasta is creamy and cheesy, and full of lots of summer veggies. What’s not to love?!? Ahhh, pasta. If you’re like me, you probably have it at least once a week in some form or another. No matter how you fix it, pasta is always a vehicle for something delicious. Though baked pastas are my FAVE, in the summer, sometimes that’s too much. So this time, I threw in everything from my local farmer’s market and called it a day. I think the combo of mushrooms, red and yellow bell peppers, zucchini, and corn was perfect. I thought about just tossing the veggies with an olive oil or butter-based sauce, but instead decided to try for a lighter creamy sauce. After cooking the veggies, I tossed in some flour and added some milk. After letting it cook down, I added cheese and herbs. I truly wasn’t sure how it would go, and was so happy with the results! In a word, or three… Flavorful, refreshing, and satisfying. Mmm! 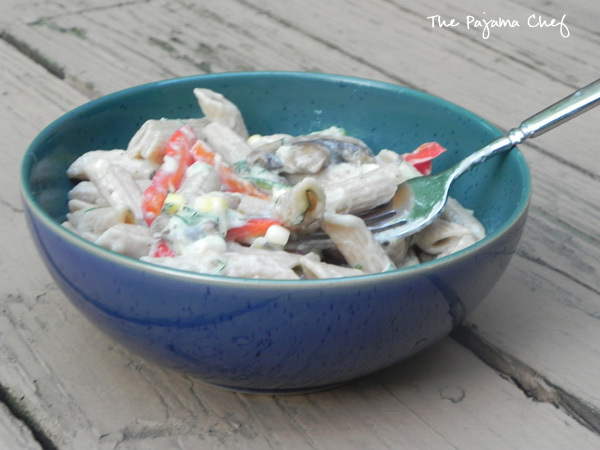 I absolutely inhaled this colorful and light pasta! It’s cheesy and creamy and super wonderful. Unlike some saucy pasta dishes, this one reheated well which was a pleasant surprise. You better believe I hoarded the leftovers and will be making this again soon. 🙂 Enjoy! Bring a large pot of water to boil and add pasta. Cook to al dente according to package directions. In a large skillet, heat butter or olive oil over medium heat. When hot, add mushrooms, peppers, zucchini, and corn. Season with pepper and cook until crisp-tender, about 5 minutes, stirring occasionally. Add garlic and saute for 30 seconds until fragrant. Sprinkle flour over veggies and stir to coat. Pour in milk and stir. Constantly stir, cooking until thick–about 2 minutes. Remove from heat. When pasta is cooked, fold pasta into sauce. Sprinkle with herbs and mozzarella. Stir until cheese melts, then season with pepper to taste. Serve immediately, or toss in an oven safe baking dish and cook until cheese on top crisps up. I think some bread crumbs mixed with butter and lemon zest on top could be magnificent too!